Here are some useful links. As they are semi-organized, links may be duplicated. 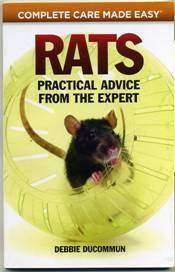 Extremely useful general guide to rat ownership. Limited print availability; available digitally. Clicker training and behavioral guide plus training for a variety of different tricks. If you only get one book, this one should be it. Nearly every "Oh my gosh, my rat just......what do I do?" is covered in detail. Even if you only ever go to the vet for care, this can help you understand the common issues you may be dealing with. Also, the first aid section will be invaluable for when your rat schedules their injury for the evening or weekend, knowing getting to the vet will be challenging. Clicking the picture will take you to Amazon where a digital version is available. You can also look here.